Hannah is one of the most motivated high school students I’ve read about recently. I sure wish we could see more stories like this in the media! Good luck Hannah and we hope your dream comes true. We’d like to welcome our newest supporter to the offical weblog of the World Dairy Expo. 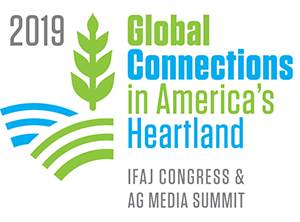 The Holstein Association is one of growing list of companies and organizations who are helping make this online diary of information about the Expo possible. The Holstein Association just completed it’s annual meeting in Portland, Maine. You can learn all about it on their website. Special thanks to Lisa Perrin for her support and we look forward to working with the Holstein Association in supporting the event! You always wonder what the person looks like who you’ve spoken with on the phone but you’ve never met. I think the same is true with the blogger you’re reading. Who is this? 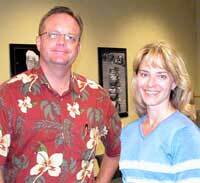 Well, The World Dairy Expo Blog is being maintained by Chuck Zimmerman, ZimmComm, Marketing & Communications. He’s the one posting everything. In fact, it’s me that’s posting this article (not the best looking one in the picture)! On the staff, Lisa Behnke, (the better looking one in the picture) is assisting with guidance on content and supplying information. I’ll be posting that information for you and covering the Expo as a very dedicated reporter, before, during and after. I got to meet Lisa today at the World Dairy Expo Office. She’s was just finishing up the program and was gracious enough to spend some time with me. I’m stopping back in next week and hope to conduct some interviews which I’ll bring you right here, so stay tuned! BTW. It’s casual Friday. That explains my Hawaiian shirt. Today your blogmaster had the opportunity to visit the World Dairy Expo headquarters building. It’s brand new and still smells that way! If you haven’t seen it or visited then at least now you know what the entrance looks like! There are a lot of pictures from past Expo’s on the walls making just walking around an interesting experience. As we get nearer this year’s show more information is becoming available. Look here to find it as well as visiting the World Dairy Expo website at www.worlddairyexpo.com! What would you like to see on the World Dairy Expo Blog? Although we’ll be posting news, pictures, results, interviews and just about anything else that comes up we want to make sure the site has what you’d like to see. Feel free to use the comments feature to write us or you can also send an email. We’ll do our best to make sure we provide all the information you want to see! 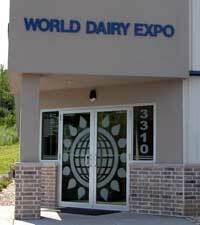 This is a busy week in Madison for the World Dairy Expo staff since they also manage the Dane County Fair. The fair goes into full swing starting Wednesday, July 20 and runs through the 24th. You can keep in touch with all the news from the fair on their website. Meet The Creative Talent Behind The "Theme"
If you’ve ever wondered who creates the themes each year for World Dairy Expo then you ought to listen this interview with Brad Nellis, Distillery Design Studio. Brad will tell you it’s a team effort and it is but he’s also the creative guy who’s been working on the themes for many years. Brad was interviewed for the ZimmCast, a weekly program found on AgWired. Announcing the first company to become a supporter of the World Dairy Expo Blog. It’s No-Bull Enterprises! As a supporter the company has a link to their website in our sidebar and we’ll post information about them and their exhibit at the show. Please thank and support our supporters! Thank you No-Bull Enterprises for taking the bold first step into the blogoshpere.